This visual analogy is stunning in its subtle execution. 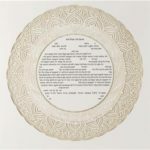 The white palette and the border of woven motifs of the Star of David give the ketubah a lacelike quality while the 24-karat gold leaf enhances its splendor and simplicity, making the Pardes a beloved ketubah. 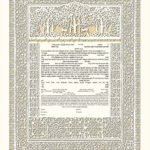 This papercut ketubah is offered with a white background. 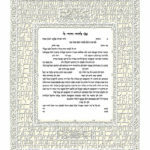 The appearance of this ketubah can be changed by replacing the white background. All ketubot by Daniel Azoulay are printed in Israel. 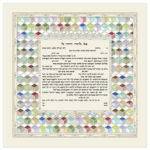 This lovely ketubah combines a rhythmic progression of a simple geometric motif with the delight of color. The repetition of the cube with subtle variation is coupled with an interplay of the rich palette that creates a sensation of joyful buoyancy. A color juxtaposed next to the right color will symbiotically define, emphasize and elevate one another. Like two distinct colors, the bride and groom, embark on their journey in life, side by side, bringing their own individual qualities and mutually enhancing and strengthening each other by the closeness of their being. Papercut on fine acid-free paper: hand-embellished with genuine platinum leaf. A limited edition; all ketubahs are numbered and signed by the artist. 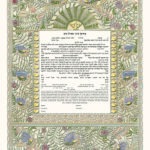 Central to this exquisite ketubah are two peacocks, shyly looking outwards, while resting under a pomegranate tree. Their feathers, billowing down like water flowing in a stream, surround the text while creating a decorative border. The sweeping organic movement of the train of feathers contrasts with the visible tranquility of the pheasants who stand in perfect serenity. suggestive of our journey in life and the strength that the bride and groom derive from their union enabling them to journey together. ” I will betroth you to me forever; and I will betroth you with fidelity, with righteousness, with justice, with kindness and with mercy.” The lyrical words from Hosea 2:21 express the deep commitment of the bride and the groom to one another. 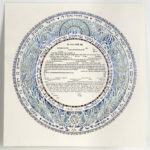 The Azure paper cut ketubah is made up of five concentric circles of imagery, ornamentation and biblical texts, which adorn and encircle the ketubah’s text. The decorative innermost circle is embellished with 24- karat gold leaf. Nature motifs, including vines, leaves and roses in full bloom, playfully intertwine against a background of gradient blue. Two deer symbolizing love, gentleness and grace repose in the shade of an olive tree, which is, in turn, protected by a canopy of myrtle leaves (symbolic of the marriage canopy). The words, Ani l' dodi v' dodi li/ I am my beloved's and my beloved is mine, from Song of Songs 6:3 encapsulate and complete this the vibrant and beautiful artwork. 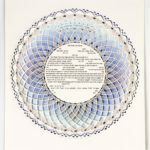 The Azure ketubah filled with movement, light and the poetry of the Bible simply brims with joy and delight. The genuine platinum leaf quietly enhances the ornamentation, while the artwork, with its three-layer paper cut construction gives us a sense of three-dimensional depth. All in all, this is a piece of elegance and sophistication that will be treasured by the couple and generations to come. Long and sweeping branches of a tree gracefully ensconce the ketubah text while being elegantly framed by intricate patterns reminiscent of carved oriental screens. The paper cut masterfully integrates natural motifs with myriad geometric patterns. 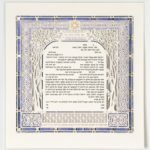 There is something simultaneously classic and contemporary, eastern, and yet very western, and tranquil but vibrant about the Blue Diamond ketubah; all of which makes it the work of timeless beauty that it is. Luminosity and color take center stage in this synchronous composition. It is a poem of palette and hue, light and movement, and fusion and modulation. The two-layered paper cut–with its rhythmic interplay of burgeoning lines-creates a strong counterpoint to the drama of transitioning color taking place in the underlying layer. There is over-all simplicity to the complexity of the design that is a visual metaphor for marriage: dynamic, always changing, full of intricacy but with the clarity and candor of love which lies at the heart of it all.